...... it is luck to receive an instrument which encompasses the properties and delicacies, and the tonal qualities necessary to support a guitarist in his musical development. The following pages should give a small look into my work as guitar luthier. Each instrument is built by hand and is a unique instrument which possesses its own "personality". It is not in my style to use big words to describe my instruments. They may speak for themselves bringing joy for the musician and the listener. My job is to take the components such as tone expectations, choice of woods, artistic and esthetic touch, together with experience, to compose an instrument of full character. The musician "opens" the instrument and breathes life into it. Through this act the instrument becomes a well of inspiration. 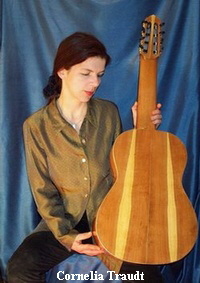 A variation on the "Aimée", with flamed mountain maple, a fine alpine spruce top and French polish, is played by David Qualey on his newest CDs "Time Passing" and "Daheim". All musicians are heartily invited to visit me in my workshop.